Its economy is growing faster than almost any other in the Middle East, its bonds pay twice as much as Russia’s and Turkey’s, and it has reined in runaway inflation. Iran is proving a draw for some foreigners with yields exceeding 20 percent on about $4.5 billion of short-term securities sold by state and private borrowers. While shedding its former pariah status will take time, Iran’s reintegration into the global economy following almost a decade of international sanctions is creating opportunities for investors willing to shoulder the risk, according to Charlemagne Capital Ltd. The London-based money manager partnered with a Tehran firm last year to add the country’s bonds to its holdings, taking comfort from repayment guarantees provided by Iranian underwriters. “I can’t think of anywhere mainstream of any significant size where you’ve got the expectation of a stable currency together with very high yields," said Dominic Bokor-Ingram, a money manager at Charlemagne, declining to disclose his holdings. The opportunity may have a short shelf life since benchmark interest rates in Iran, now at 20 percent, are bound to fall as inflation decelerates, he said. 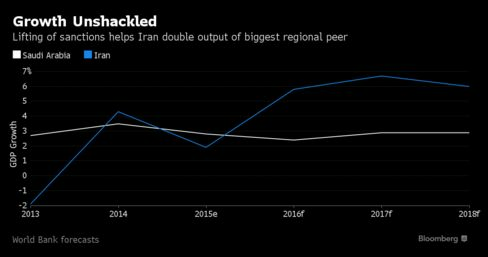 The end to Iran’s international isolation has spawned partnerships such as Charlemagne’s in the country of 80 million people, whose economy is set to grow 5 percent annually over the next two years, faster than any regional peer after Libya and twice the rate of Saudi Arabia, according to World Bank forecasts. Trade ties are being renewed with France as an oil tanker for Total SA is loaded at Kharg Port this week, the first crude shipment to Europe since international sanctions ended. Equity trading by foreigners has jumped 10-fold to 500 billion rials ($16.6 million) since sanctions were lifted last month, according to the Tehran Stock Exchange. The allure of Iran’s debt market is also likely to pick up as the country moves closer to securing credit ratings that will allow it to issue Eurobonds. Fourteen years after Moody’s withdrew its speculative score of B2, the government said it’s talking to international ratings firms for new grades. In a bid to deepen its domestic market, Iran made 400 billion rials of Treasury bills that comply with Islamic law available to trade in September. While the price of those zero-coupon notes can change, corporate and state-linked securities have fixed interest, according to Charlemagne’s co-manager Turquoise Partners and Agah Group in Tehran. Payments are guaranteed by the underwriting bank, they said. Real yields are payments an investor can expect after inflation of 13.2 percent is stripped out. The rate has decelerated from 40 percent in 2013, compared with the central bank benchmark Turquoise says is 20 percent. As policy makers bring that rate more in line with inflation, bond yields will drop. Turquoise estimates the equivalent of $3 billion of debt securities are listed on Iran’s bourses, while official estimates put the figure at approximately $4.5 billion when sovereign bonds are included. New notes are issued at a maximum rate of 1 percentage point above the benchmark interest rate, while the older securities yield more, according to Radman Rabii, vice president of international clients at Turquoise. Investing in Iran still requires a leap of faith because some U.S. sanctions remain, said Chrisol Correia, director of anti-money laundering at LexisNexis Risk Solutions in London. He cited legal obstacles, such as determining the ultimate beneficial owner of a company issuing corporate debt and whether it’s linked to an entity that’s not exempt from the penalties. While the majority of those sanctions were removed in January, restrictions remain in place on about 200 businesses and individuals, some of them connected to listed companies. Iran is betting there will be appetite for its debt and has pushed ahead with efforts to issue $1.5 billion in Treasury bills and plans to sell a further $300 million by March 20, Securities and Exchange Organization Chairman Mohammad Fetanat said in an interview in Tehran this month. Fetanat forecast the market could reach $120 billion within three years. Iran Oil Pension Fund Investment Co. announced in January plans to sell a four-year rial bond, with an annual yield of 21 percent. Five-year Russian and Turkish local bonds offer 10.39 and 10.57 percent, respectively. A key risk is the potential depreciation in the local currency, which Behrad Ebrahimi, head of trading at Agah Group, said may weaken this year after outperforming other emerging-market currencies during an oil slump. The currency, which is managed against a basket, has fallen 2.1 percent compared with 20 percent for Russia’s ruble in the past six months. “There are risks, but you have higher returns,” Ebrahimi said by phone from Tehran.